Helena Casas-Tost (1976-) is a lecturer in the Department of Translation and Interpreting at the Universitat Autònoma de Barcelona, Spain. Her research interests include Translation Studies, teaching Chinese as a Foreign Language and Contrastive Linguistics. She has published numerous articles in journals on Chinese –Spanish translation, Chinese linguistics and teaching Chinese as a foreign language. 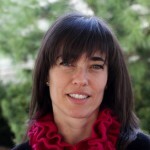 She also works as a professional translator translating from Chinese into Spanish and Catalan including Chinese films.